A mid-century jewel with a private yoga studio. Cactus Moon Retreat sits at about 3,500 feet above sea level on 2 1/2 acres of desert oak, piñon and juniper studded desert on the north flank of the Little San Bernardino Mountains. Just up the road from the property is the boundary of Joshua Tree National Park and just to the west is the Big Morongo Canyon Preserve. The property offers a stunning, unobstructed vista directly toward the tallest mountain in Southern California – San Gorgonio Mountain. Visible to the north are desert mountains that define the southern periphery of the Sawtooth Wilderness, with Pioneertown just beyond. 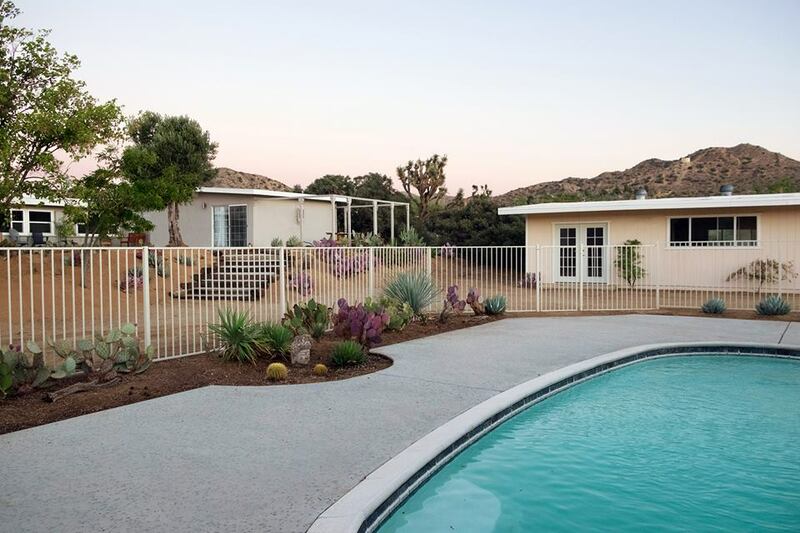 The property may be in the Town of Yucca Valley but it is cradled on three sides by some of the most marvelous and wild high desert terrain in California. The house includes three bedrooms, two bathrooms, living room, kitchen, dining room, sunroom, and office. Two of the bedrooms offer queen beds and share a full bathroom off the hallway. The master bedroom offers a California king bed and is en suite with its own bathroom (with both shower and bathtub). The pool house, which is a charming converted horse stable, includes three bedrooms (one en suite) and one bathroom. The en suite bedroom #4 has a king bed (that can be converted into two twin beds upon request), bedroom #5 has a full bed, and bedroom #6 has a queen bed with a queen pull-out coach. 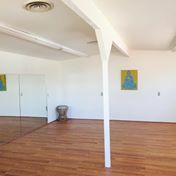 The yoga studio is a single large room (20 feet by 30 feet) that can accommodate approximately 15 yoga enthusiasts. It can also be configured to accommodate meetings with perhaps 20 participants seated comfortably. The architectural style of the buildings might best be described as “high desert ranch”. The original portion of the house is constructed of brick with open beam sloped ceilings. Floors throughout are rustic Mexican Sautillo tiles (except in the yoga studio).